Walking outdoors in the St. Croix Valley under autumn trees I can't help but notice the colors. I'm talking, of course, about the colors of the rocks. Glaciers deposited layers of rocks and sand over the existing bedrock thousands of years ago and as a result we can even find every color of rock imaginable. On a hike with the rest of the staff at the Lee & Rose Warner Nature Center this fall I kept my eyes open for a particular kind of rock. I wasn't finding my quarry but our naturalist intern Jen, also interested in geology, picked up a palm-sized rock and commented on its beauty. She had unknowingly found exactly what I was looking for. Red and black bands streaked across the irregular dirty surface. (see photo above, it is about 4 inches across.) It looked pretty unassuming but this is a rock with a spectacular history. I took a deep satisfying breath as I turned it over in my hands examining it closely. In a way, I had this rock to thank for the oxygen in that deep breath I took. Not only is it one of the oldest rocks on earth, about 2 billion years old, it's also a fossil. 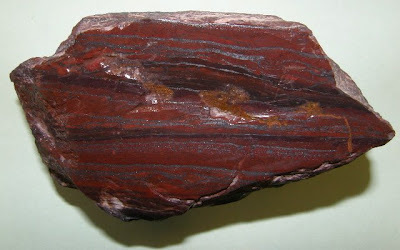 The red stripes are form of chert called jasper and the black stripes are either hematite or magnetite. Stripes are often a sign of a sedimentary rock laid down slowly layer-by-layer. Residents of the St. Croix Valley are no strangers to sedimentary rock. The limestone that pokes out around the valley is sedimentary rock. As their name suggests these rocks are usually sediments compressed together into hard rock by time and pressure. This sedimentary rock is different though and not just because it is more than 1.5 billion years older than the limestone of the valley. This rock is called a stromatolite and it is evidence of one of the earliest and oldest forms of life on earth. Billions of years ago, shallow seas harbored colonial cyanobacteria. Scientists think we have these cyanobacteria to thank for the formation of an oxygen rich atmosphere on Earth. When these creatures gave off oxygen from photosynthesis they helped change the atmosphere but some of the oxygen combined with dissolved iron in the water and these new iron oxides fell out to the bottom where they got stuck in the slimy coating of the cyanobacteria. Slowly, layer-by-layer, the mats of cyanobacteria got thicker and thicker forming banded layered stromatolites. The iron impurities in silica created the red bands of jasper and the silvery hematite is simply iron bound to oxygen, one of those iron oxides formed long ago. There are massive deposits of these iron rich rocks in northern Minnesota and we know those formations today as the Iron Range. The work of these tiny creatures billions of years ago helped us by creating not only the atmosphere that sustains us but also the iron in our cars, buildings and cookware. Glaciers pushed this chunk of rock here from up north during the last ice age a mere 10,000 years ago. I ground and polished the rock we found that day until the red jasper glowed the color of blood (which is also red because of iron) and the hematite shined like polished aluminum. The reds of autumn have faded but the bands of red jasper in my hands will last for millions of years more and serve as a reminder of the beauty and complexity of our ancient planet.